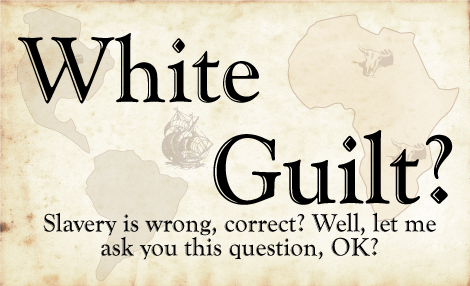 White Guilt? 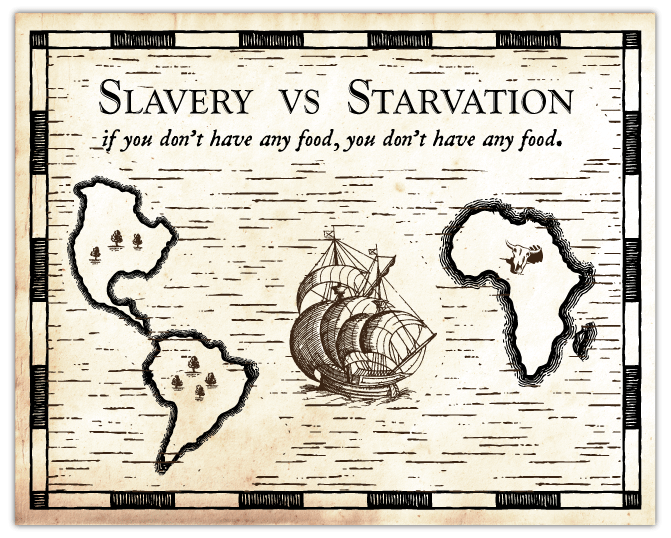 - Slavery vs Starvation - ...if you don't have any food, you don't have any food. Someone on the Left (possibly BLM/Antifa type) said, "Slavery is Genocide." As a response, it was said that they thought it was just the opposite 300 years ago. Slavery saved many Africans from war, border war, civil war, drought, famine, disease, and starvation. Specifically, It was asked, "If there was no Slavery, where in Africa for the last 1,000 to 2,000 years could the slave and his family live (in Africa) such that there was no war, border war, civil, war, drought, famine, disease or starvation?" There was no real response, just name calling. And just in case it hasn't occurred to you, it's really hard to grow crops in a war zone and the Africans didn't have to be chained to be put on a slave ship as "the land" they lived in had no stable food supply or water. Hence, all the slave trader had to do was provide (a) fresh food, (b) water and (c) the hope of a better life than what they saw in Africa which was starvation, starvation, starvation. Can anyone (including historians) say that not a single person from Africa, living thru decades of war, disease, drought, famine, and starvation didn't want to leave Africa in exchange for being a slave (or a lifetime of employment or indentured servant)? Or can anyone say that not a single African didn't voluntarily offer themselves as a lifetime of service to their rescuer from starvation? Also, there was no "morning commute" back then. You didn't have cars. You either walked or rode horseback. Hence, it was only logical you worked and lived on a plantation. Likewise, Slavery was a typical (and logical) form of employment contract back then as the Slave and his family was a permanent part of the plantation to survive. The freedom to live anywhere Today was not technically practical back then due to limited forms of transportation. Aside, the Masters and Slaves on a Plantation had more mutual respect for each other as both of their lives and families depended upon each other daily to produce food. This in comparison to the American Ghettos and Inner City Public Schools of today where many inner city public schools are 99% Black. And going back and forth from America to Africa was very costly and dangerous. The sailors and captain had to get paid, a lot, for the risks they took as many died at sea. Moreover, that ship was not built for free. Hence, the Africans leaving Africa had to pay some sort of compensation for passage. This, not to mention, African Slaves didn't create or fight for this new America country, the Declaration of Independence, or the US Constitution. Or for that matter, African Slaves didn't create or fund the plantations that were already operating when they arrived by ship or get the customers to buy the crops the plantation were producing. They also didn't create or build the existing towns and roads they used when they arrived in America. You could easily prove that in regards to African Slaves and the Declaration of Independence, the phrase created equal does not mean currently equal, and created equal does not necessarily mean everyone believes in equality. Looking back, the Declaration of Independence was totally new at the time, the Constitutional War was fought not so long ago against the King, the British and against Tories on American soil. Hence, what did African Slaves believe in regards to types of government? Monarchies or Democracies? Could they be easily swayed or fooled by the King or other foreign monarchies to revert back as most countries back then were ruled by monarchies or kings? So yes, African Slaves could easily swayed to be revert back to a monarchy. For example, African Slaves didn't not know English and had to be taught a new language. African Slaves came from a land of savages and likewise the reason why they were always at war with each other (and even so Today) and hence starved themselves to death via their own savagery. What do you with a savage who always attack anyone around them? Well, an iron collar and chain is sometime necessary to teach savages to be civilized and that they, savages, will not starve to death if they work together to grow and harvest food. Lastly, African Slaves did not fight a war on the principles of Democracy, were not ruled by a far away king, didn't pay taxes to a far away king, were not literate and didn't understand many basic principles of a free trading economy and a long list of things of a civilized society. In other words, created equal does not mean currently equal. "The ball should bounce the same for everyone. ...Equality"
Yet, does that also mean the "final score" should be the same at the end of the game? Addendum #2: When Slavery was Abolished, that effectively ended any financial incentive to bring slaves over from Africa. Hence, the 13th Amendment could easily be considered "racist" toward Africans as a whole as that effectively ended any migration of Africans to America. The Bible doesn't say Slavery is a sin, but tells slaves to obey their masters. (ref Ephesians 6:5, 1 Peter 2:18 and Collossians 3:22). Yet, since this a highly charged topic in regards to reasons for the Civil War, one could ask, "If Slavery was a sin, why pay taxes to Caeser?" Isn't paying taxes to the government for your entire life? Yet what did Jesus say about paying taxes to Caesar? Moreover, if Slavery was so bad, why not take a look Communism? At least with Slavery in America, slaves did not starve to death like the citizens of communist countries did. Historians of Slavery and Lynchings are referencing other references who in turn make references to other reference. 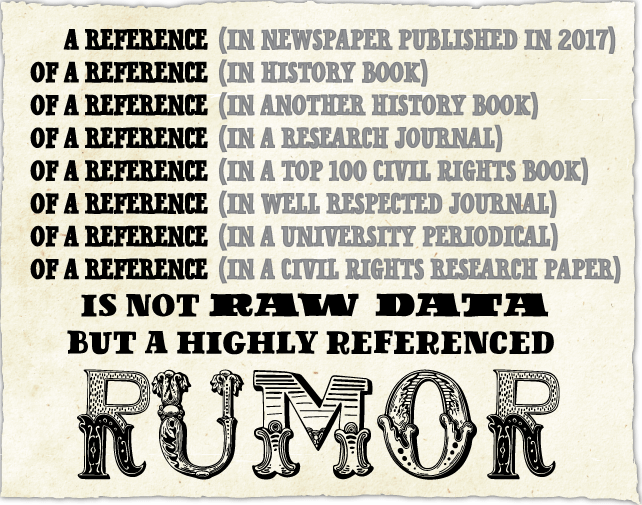 Hence these Historians' research data is just a bunch of references, not raw data. Lynchings: There were supposedly thousands of lynchings, however, this contradicts that time when crime was so low where you didn't have to lock your doors. Additionally, before 1882, there were no records of lynching, but a Chicago newspaper attempted to do this and the Tuskeegee Institute began to tabulate lynchings. However, it has to asked, "Were their sources various views and articles of the same public lynching?" Lynchings were many times a very public event and hence, there were many reporters and articles of the same lynching except from a different angle. Again, this repeat reporting of the same lynching makes it look like a numerous different lynchings. This appears to be how the Today's Media operates it's news cycle. Same event, but the Main Stream Media sends all their reporters to the event and each report it with a different angle. Next, in the Big Picture of things, why would American citizens, 300 years ago, allow Africans, who would not be slaves under their control to compete against them for food and water in an uncharted and dangerous new land? If Africans back then were constantly fighting against each other in Africa, why allow them freedom in America to create the same border and civil wars for food and land as they saw in Africa, and hence starvation? Likewise, back then, 300 years ago, in an uncharted and unknown land, you had a far better chance to survive and not starve to death if you weren't literally at war with each other. Hence, in times of great uncertainty and enemies, does not a country imposed Martial Law? Likewise, when America was NEWLY FORMED country, shouldn't there have been rules on who and how people could enter into a very small country with very few people and very few working resources? With Indentured Servitude, where was the farmer going to get "labor" in the future once the indentured servent served out his/her contract as there were not many people in America at the time and the future for America, a totally new country, as well as the land itself, had a very uncertain future? Second, with Indentured Servitude, why allow the former servant to compete against you economically in an unknown land with very little people to replace the servant? Accordingly, in an unknown land with a country not even existing, why invest all the time and effort into a worker only for that worker to quit and compete against you and especially when food sources and water are unpredictable and back then, you lived from harvest to harvest and limited food preservation knowledge. Hence, Slavery is the only wise option in an unknown land with no real laws and unproven future. In other words, Slavery is comparable to say, "military service and non-compete contracts" in difficult times and unknown lands. NOTE: Before the United States of America was formed, there were still Kings, Queens, Emporers, Czars, Monarchies and a ruling class. Hence, slavery was just another level of society.